I am pleased to announce that my concert will be performed in Harajyuku Casa Mozart on Friday, 9th November 2018. 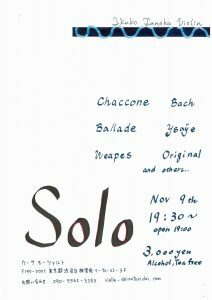 This time I perform solo an unaccompanied music played with a violin. The composers of these music are Bach, and Ysaye etc. In addition, I will play the original improvisation. I am also a musician and I would like to follow their histories. I am looking forward to seeing you all in my concert. Contact 090-5562-3250 if you have any inquiries. © Copyright 2019 Violin Ikuko Tanaka. All rights reserved.